We all love a summer picnic, but we love them even more when we don’t have to pack them ourselves! Heading into warmer days, we’ve searched the city high and low to find the Brissie restaurants that will do it all for you, no washing up required! Need a spread for two, four, or more people? Popolo has the answer! 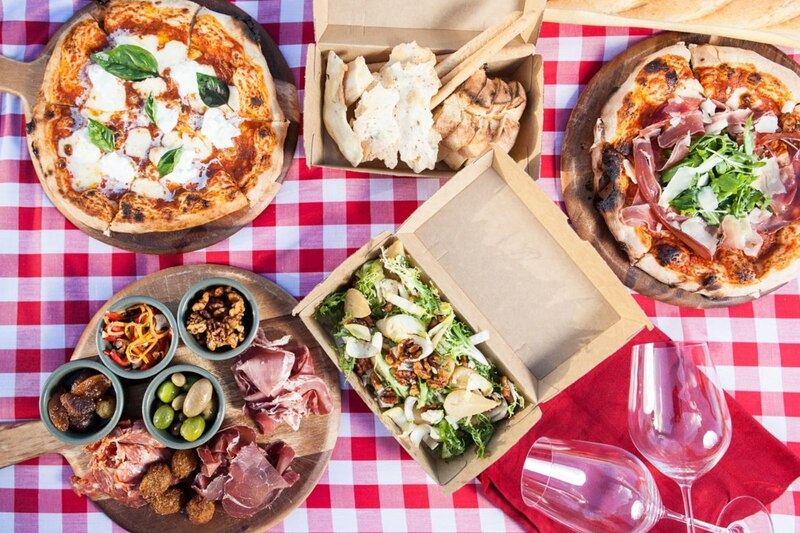 Their picnic per due (two) includes a selection of salami, cheese, mustard fruits, pickled vegetables and breads plus a mixed leaf salad, fries, pizza and two soft drinks for $65. For four people ($90), you’ll get all of the above and in addition, an olive ripiene (olives stuffed with ricotta and nduja served with a saffron aioli), an extra pizza and two extra soft drinks. For the mother of all picnics, you’ll be best served getting the Quattro grazing picnic. It has all the above PLUS summer pea and mozzarella arancini, calamari fritti, a cheese platter with quince paste and candied walnuts, pear and gorgonzola salad with candied walnuts, a Caprese salad, and a wide selection of soft drinks. Your weekend afternoon in the sun is sorted! Grab yourself a Malt Dining picnic hamper and enjoy a quiet day in the park or a romantic evening by the water, all while sipping on your favourite bottle from the Malt Traders range. Using premium local ingredients, their gourmet menu includes mixed olives, crackers, prosciutto and a crusty bread stick among other goodies. Pick one up from their stores in Brisbane City or the Valley for just $75 and return the next day knowing you won’t be stuck doing the dishes. WIN! Sourcing the best food and wine from Europe and Australia, you could say New Farm Deli has all your hamper needs covered. Whether you’re after bubbly and nibbles, tea and bikkies, champers and strawberries, all the cheese you can eat or a Christmas-inspired hamper, you will be sure to impress with whatever you choose! Pick-up is available, or for same day delivery be sure to order before 11am and prepare to descend into a food coma of epic proportions. Warmer weather means platters, and what’s better is that the Croft House is located within walking distance to both Southbank and the Botanic Gardens! Available Monday to Friday, feast on sandwiches, charcuterie, cheese with fig fam and trail mix, and fresh fruit. Platters can be made for two ($60), four ($80) or six ($100) people so all you need to do is give them 24 hour’s notice, pay, pick it up and enjoy! Aquitaine has got you covered with not one, but TWO delectable hampers to choose from. The cheaper (but by no means less classy hamper) includes marinated olives, house-baked bread, house-made charcuterie and pickles, as well as a selection of cheese and other tasty accompaniments, plus a Santa Vittoria sparkling or still water (boujee AF). For a hamper to share with that special someone, a glass of French sparkling wine for two guests will be served while you select your shared entree from their current menu to take with you. Your hamper will be prepared for you to enjoy down on the River Quay Green with sweeping city views. Once you have devoured every last bit of your spread, your waiter will deliver petit fours dessert and coffees to finish. The regular hamper will cost you $50 while the deluxe option will set you back $115. Both hampers are made for two people. Planning a visit to the city Botanic Gardens? TGC has you covered! For a picnic with the fam, their family picnic will set you back $60 and includes four freshly-made sandwiches, two servings of juicy fruit salad and four cold drinks plus a chef’s selection of sweets. To take your date, anniversary or special occasion to the next level, try their couples’ picnic basket for $50 which includes mixed olives, fresh deli meats, house-made pickles, cheese and crackers, house dips, and a chef’s selection of sweets plus two cold drinks. This must be what picnic dreams are made of! With all of these options, we challenge you to pic(k) just one!